Bloom Organic Complexion Soap is an extra creamy, gentle facial soap formulated especially for the needs of maturing skin. To our rich organic olive oil base, we've added emollient organic avocado oil and organic shea butter, plus organic rose hydrosol and the pure essential oil of Bulgarian rose. Then, we used a special process of whipping the setting soap, to create a unique lightness and texture unlike any of our other soaps. The result is an incredibly gentle facial soap that your skin is going to love. Bears the very light scent of rose, but not overpowering or "perfumey". Excellent for very sensitive skin, including those with rosacea. Ingredients: Saponified Oils of *Organic Extra Virgin Olive & *Organic Coconut, *Organic Shea Butter, *Organic Palm Oil, *Organic Avocado Oil; Pure Essential Oil of Bulgarian Rose, *Organic Rose Petals, *Organic Rosehip Seed Oil and French Rose Clay. 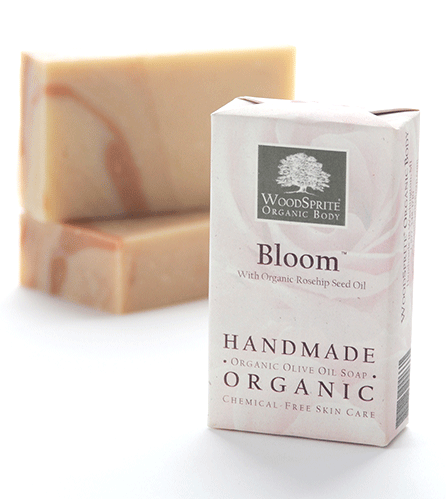 (*Certified Organic) Paraben-free, Pthalate-free and Preservative-free. 4 oz. wt.